Potato Salad is the ultimate cook out food. I don’t think I’ve ever been to a cook out that didn’t serve this side dish. It’s a southern staple. However, I had never made it before. Cook outs are a summer thing, so I knew that the one Zack was having at work would be my last chance to make some this year. I found a recipe that seemed easy enough and decided to try it out. Every bit of it got eaten at Zack’s cook out. People were raving about how good it was. I don’t like potato salad, so it didn’t appeal to me, but that’s besides the point. I like that you slice an egg and sprinkle with paprika for the top. Makes it look decorative and fancy. Prep: 15 minutes. Total: 1 hour 5 minutes, including cooling. Makes 12 servings. Cook potatoes in boiling salted water in large saucepan 10-15 minutes or just until tender; drain. Cool. Meanwhile, chop 2 eggs; slice remaining egg. 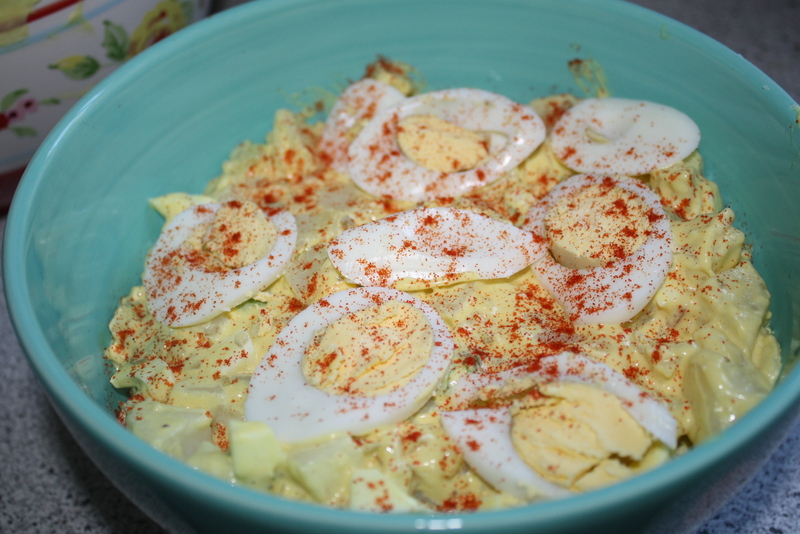 Mix mayonnaise, celery, onions, chopped eggs, relish, mustard, and sugar in a large bowl. Gently stir in potatoes. 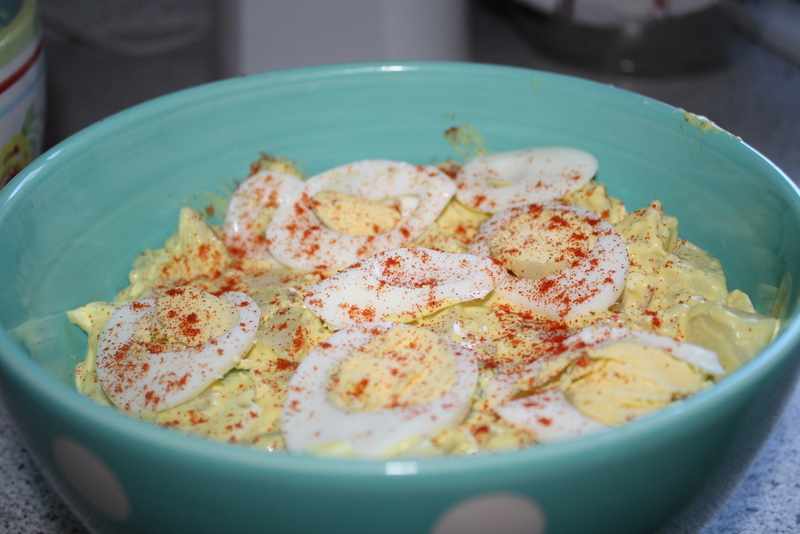 Top with sliced egg and paprika. Looks great! I usually top mine with sliced hard boiled eggs and paprika, too. Your right, it does make it more festive.